Persistence Market Research uses a unique research methodology which is a strong blend of secondary and in-depth primary research. Extensive primary interviews with key market players, stakeholders, market observers and experts are carried out to collect necessary data and information pertaining to various segments and across key regions. The data crunching and statistical analysis so performed undergoes multiple layers of validation to garner appropriate market insights which could benefit business by impacting critical decisions. The exhaustive research methodology has been applied to thoroughly understand and study the market for shrink bags and the findings and insights have been skilfully crafted following a systematic structure in a new report on global shrink bags market. The market research report on global shrink bags is a comprehensive market research study which focuses on the global scenario and provides actionable acumen on various factors which influence the market which is possible with the help of strong data and statistical analyses. It delivers an unbiased view of the market by including analysis on various market segments across the major geographies of North America, Latin America, Europe, Asia Pacific and Middle East and Africa (MEA). The global research report on shrink bags market has in-depth weightage on statistics, figures, numbers and graphs which is based on a clear market definition. This will enable the reader to take informed decisions with the help of well-furnished insights. The upcoming trends and developments, new innovations in products and varying product portfolios, new acquisitions, end user analysis and much more actionable acumen give a 3600 view to the market ultimately providing the reader with necessary tools to devise strategies in order to establish firm grip in a particular region or in a particular segment in the global shrink bags market. The global shrink bags market research report covers competitive landscape, which covers the market shares, revenues, growth strategies applied, product portfolio analysis, distribution channels, expansion in several geographies, marketing strategies, SWOT, pricing analysis, etc., of the various key players in the global mobile handset protection market. Such an intelligence framework can be used to devise appropriate strategies in order to gain competitive advantage in the long run. According to Persistence Market Research, the global shrink bags market is anticipated to show consistent growth during the forecast period. During the 2012-2016 timeline, the global market for shrink bags reflected slow yet an upward trend with respect to adoption of shrink bags in several applications. The analysis of the report portrays that the 2017-2025 timeline is expected to present high growth opportunities for shrink bags market. In 2017, the global shrink bags market was valued at around US$ 2900 Mn and is estimated to touch a value bit higher than US$ 4500 Mn by the end of the year of assessment, 2025. 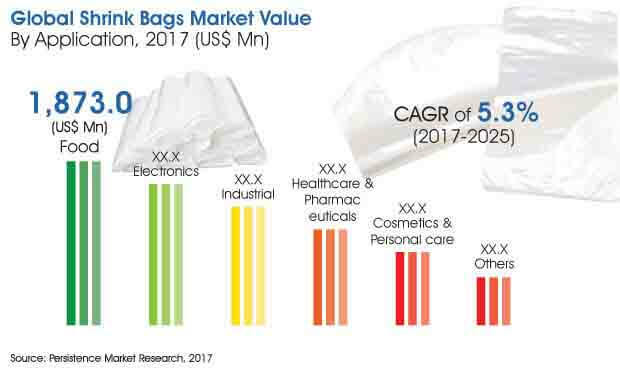 The global market for shrink bags is projected to grow at a steady pace to reflect a value CAGR of 5.3% and a volume CAGR of 5.0% throughout the period of assessment. Manufacturers operating in the shrink bags market are more focused on sustaining their revenue growth owing to increasing competition across the globe. Several players are eyeing emerging economies to develop new markets to achieve sustainability in their revenues. Moreover, the overall consumer packaging market has been witnessing a paradigm shift towards development of untapped market in emerging economies. In addition, the growing population in emerging economies can present lucrative opportunities for growth in adoption of shrink bags, thus supporting the manufacturers of shrink bags to gain additional revenues. Lamb, beef and other processed meat are highly consumed across countries in Middle East and Africa and Europe. The demand for red meat is increasing, which in turn is expected to trigger the use of flexible packaging solutions. Bone meat products can cause damage to packaging bags during transportation, which also affects the quality of the product inside the packaging. This led to the production of protective packaging solutions – shrink bags – with the help of technological advancements. Shrink bags have the extended shelf life of bone meat products owing to additional strength and toughness. This has spurred the adoption of shrink bags across the globe. Shrink bags are used in various applications. However, they have witnessed increased demand from the food sector since past several years. The growing food industry is expected to spur the sales of shrink bags owing to their usability in packaging different food items. Shrink bags offer high durability and tend to extend the shelf life of the product they are carrying. This has gained high steam, especially for packaging meat products and low shelf life products. In 2017, the food segment was valued at around US$ 1800 Mn and is expected to be valued at about US$ 2800 Mn. This jump in sales revenue of shrink bags in the food sector can be attributed to an increased adoption in this industry, which is expected to portray a value CAGR of 5.5% throughout the period of assessment. In the food segment, the meat sub segment is a rapidly evolving segment which is spurring the use of shrink bags. This sub segment is expected to largely contribute to the growth of the food segment in terms of sales revenues of shrink bags. Shrink bags are widely used to package meat products across the globe. The meat sub segment is estimated to reach a value of more than US$ 1 Bn by 2025 end and is projected to grow at a value CAGR of 5.4% throughout the period of assessment.